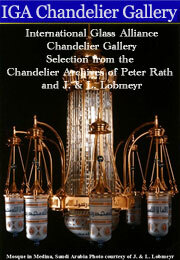 Click the images to the left or right to view image selections from the Chandelier Archives of Peter Rath and J. & L. Lobmeyr. Peter Rath is the fifth-generation co-owner of J. & L. Lobmeyr, as well as Vice President of Light and Glass: The European Society and Documentation Centre for Chandeliers, Light and Lighting. 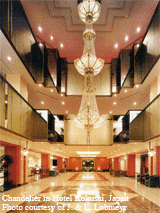 Mr. Rath is renowned for his chandelier design and his extensive knowledge of glass, lighting and cultural history. 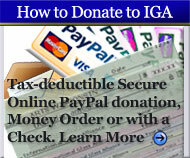 The images shown are courtesy of Peter Rath and J. & L. Lobmeyr. Please view our Gallery Page for more images and videos. 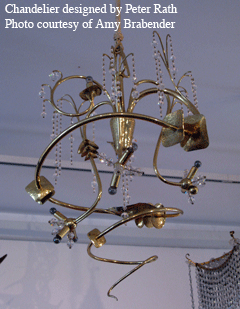 This glass and bronze chandelier was one of earliest chandelier designs by Peter Rath (b. 1939), fifth-generation co-owner of J. & L. Lobmeyr. Designed and executed for his Gürtlemeister Master’s project in 1968, this asymmetrically-designed chandelier incorporates a brass spiral-like body to which hand-hammered brass elements, miniature light bulbs and crystals were attached. 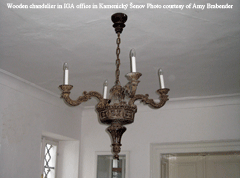 Hanging in the foyer of the IGA offices in Kamenický Šenov, this wooden chandelier dates to the mid-17th century. Created from two exquisitely-carved wood wall brackets which were screwed together, the chandelier originally held candles. Wooden chandeliers were often constructed as a less-expensive alterative to glass chandeliers. 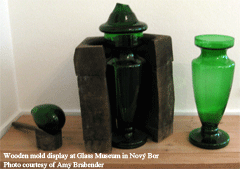 These wooden molds were used to demonstrate the typical Bohemian potash glass technique of blowing the glass gather into a damp wooden mold to achieve the desired form of a glass object. This 17th-century technique was a precursor to the era of mass-production: the molds allowed forms to be standardized and reproduced in large quantities. 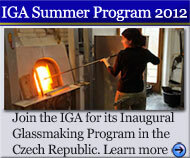 This technical advancement was an important factor in the rising success of glass in this region during this period. Wooden molds were (and still are) used in both chandelier and vessel production. Beechwood is the typical wood used for these molds; they are lathed by hand and cut in half to make it easier to retrieve the blown object.